3 Bedroom Detached House For Sale in Chesterfield for Offers in the region of £175,000. 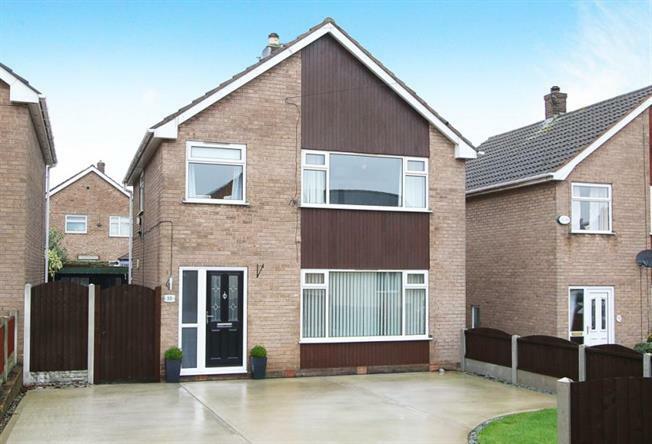 We are delighted to offer for sale this very well presented three bedroom detached property with garage situated in Brimington. The property comprising of, to the downstairs; entrance hallway, two good sized reception rooms including lounge and dining area, lovely fitted kitchen complete with white wall and base units, rolled edge work surfaces, stainless steel sink and drainer, built in oven, hob and extractor fan. Space for fridge freezer. To the upstairs there are three good sized bedrooms and family bathroom complete with suite in white. To the outside there is a good sized enclosed rear garden with patio area and to the front is ample parking. Brimington is a popular residential area located approximately two miles to the north east of Chesterfield, with good access to the M1 Motorway. There are excellent local amenities including local shops, small library, various businesses including a chemist, car garages and showrooms, shops, churches, schools and doctor's surgery. Brimington is also located close to the magnificent Ringwood Hall; a beautiful Georgian grade 11 listed Manor House where you can enjoy dinner and drinks.